How divine she was; trés élégant really. Tall and thin, alert eyes rimmed in white mascara and gleaming, her breast shimmering, catching the afternoon light like a pillow of ruddy silk…her heart turned inside out. I watched through the binoculars, delighted with her economy of motion, her intensity and focus. Her perkiness. I’ve never found robins to be particularly beautiful – quite common, actually – but on this day, in this light, on this mission, she enthralled me. She’d scurry through the grass a few steps, then stop, stretching herself upright in one swift movement, back straight, head high, tail feathers outright. Her body seemed to elongate, as she sought the tallest vantage. Then she’d dip her head, sally forth, then bolt upright again, like a long-waisted groundhog peering above the grass. She was in her glory. As I watched, she filled her bill with dragonflies, worms, insects. Occasionally, she stretched her neck and bobbed her head, opening her bill just enough to shuffle the feast, getting better purchase. I watched her gathering a varied harvest for her brood and shortly, filled to capacity, she flew into the trees. Moments later, she was back, foraging again. How I envied her easy assurance. As many hours as I’ve spent, steadily paring down the excess and clutter – the diversions of life – to reach into the real heart of me, I still have days when I grasp for the sense of peace that comes from knowing I am in the real, honest, gushing current of what I do best. Then I pine for one of those moments that come quickly, without warning, elevating the common to sublime. Rare gifts of kindness, they are; a glimpse of another horizon to acknowledge I am on the right path. Much later, as afternoon waned, I heard the robin’s satisfying song bursting forth from the shelter of trees, a complex melody larger than she, notes carried on currents unseen, but trusted; a song birthed in her very soul, a song she was born knowing. In that moment, she was joy: joy of living, of providing, of fulfilling…joy of simply being. She was made for this. This lovely, all of it… the observations, word pictures and the meaning you’ve drawn from the time with robins. We need to remind ourselves of what life is about and what we are about more often. Thank you for this. There were so many things I overlooked because I was always ‘too busy’, Carol. I seem to be delighted by the smallest of things lately. Don’t take me for a walk; it’s like having a child along! We had babies here early in June…I wonder if there may be a 2nd brood this year. 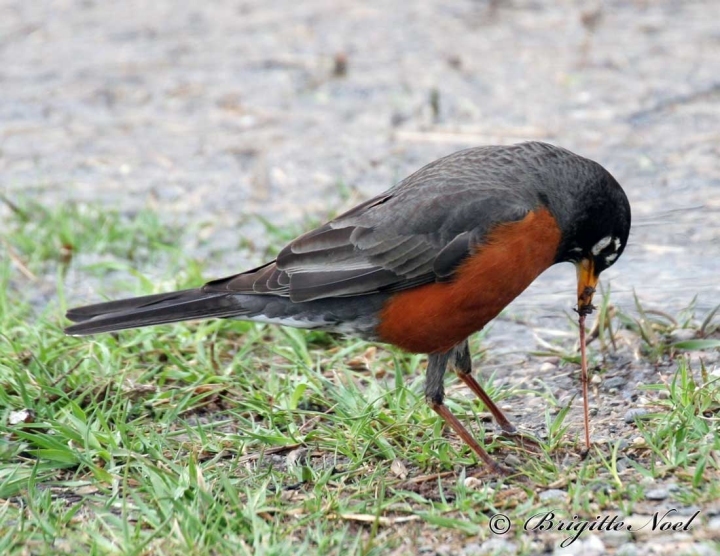 I saw a robin going yesterday with twigs in her mouth. I think we’re all on this journey of self-discovery in relation to our God and the peace that finding our centre brings.